Construction projects going through the city permit process are required to cite how much water demand they will impose on the city's water supply and whether the city has surplus water supplies to accommodate the project. 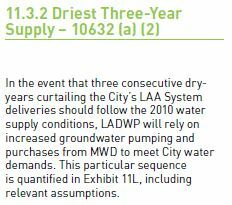 2010 UWMP states that MWD would make up for city shortfalls. This information is provided in the EIR (Environmental Impact Report) which is part of the permit package for the project. The EIR's have a section on 'Utilities' stating where this surplus water will come from. As evidence of sufficient surplus water, the EIR's refer you to the city's current UWMP as evidence. The UWMP also describes how it will meet demand should there be a shortages of city owned water. 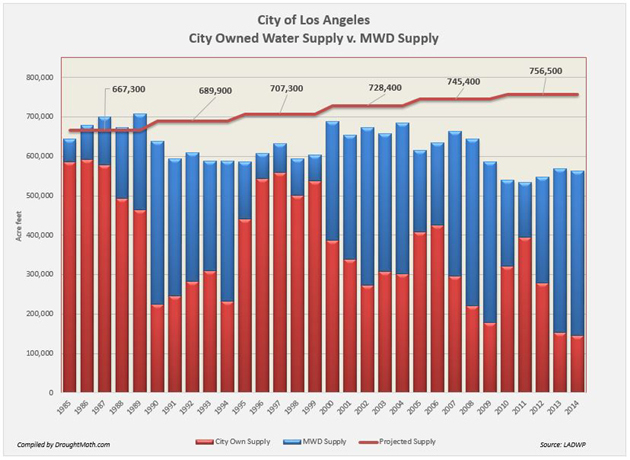 When water shortages occur the city's water plans state that they have access to MWD supplies that will meet the city's level of demand. 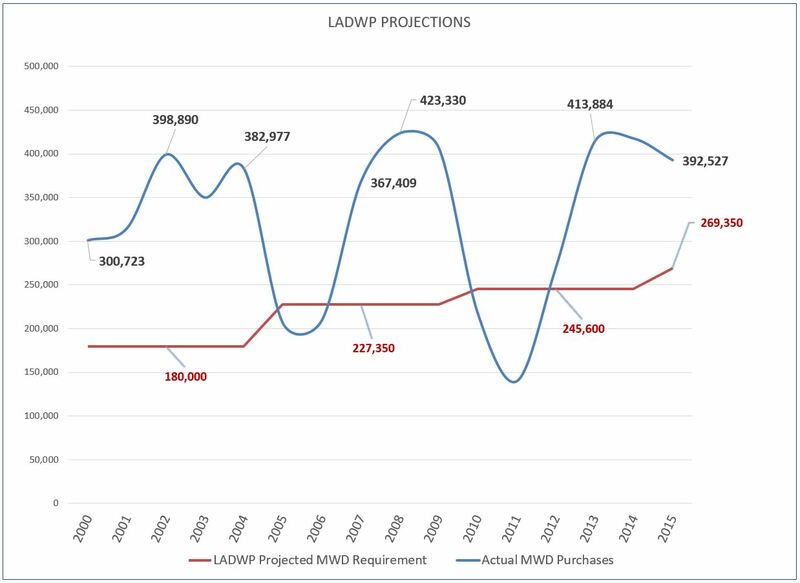 The chart below shows us that despite the UWMP's guarantee that the Metropolitan Water District will be able to provide sufficient water supply in dry years, the DWP has not been able to meet that guarantee since MWD supplies have come up short of the projections every year since 1990. The deficit the city finds itself in is a result of this gap. Because this has been allowed to occur for twenty five years and never corrected in each subsequent UWMP, we have to assume that these statements in the UWMP assuring that MWD will meet demand are mainly intended to facilitate approvals and nothing more. As such, it is a planned deficit. MWD supplies DWP water during shortages but has not been enough to meet the city's demands. Where does the city's water go? This chart shows us how much water is used in each of the city's consumer classes between 1985 and 2014*. Since 2007 single-family residential demand has fallen from 261,530 Af to 208,678 Af. Multi-family residential has fallen from 187,059 to 169,192. More importantly, Residential per capita has fallen from 106 gallons per capita daily to 86. *Supply shown in 'water years' (October thru September). 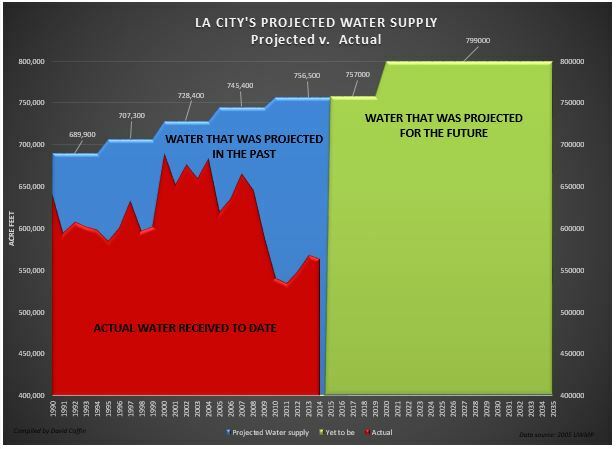 The City of Los Angeles water plans in the past have projected significant amounts of water that later never came. These large sums of water have been used to approve small and large projects going back to 1990. When projects are reviewed by city planners, the figures cited in the city's water plans are supposed to assure the community that there is sufficient water for the project over the next 20 to 25 years after they are approved and that the project will not pose a burden to the city's water supply during that period. Over a 24 year period, this missing water would be equivalent to 4.35 million acre feet which is slightly more than a full years worth of California Aqueduct water at full allocation. 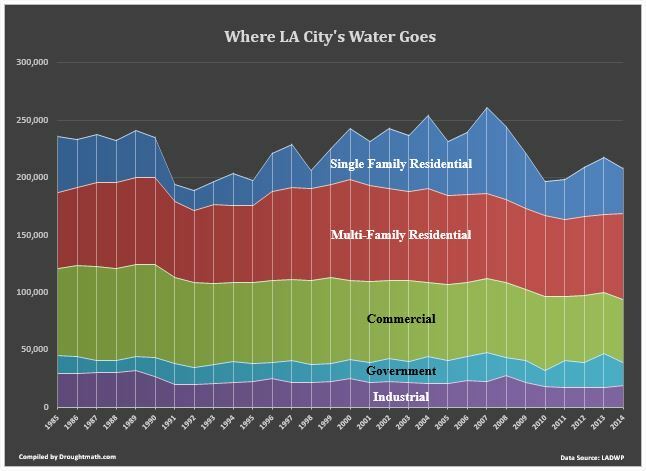 This graph shows the City of Los Angeles's history of 'paper water' since 1990 and the actual amount of water it has been able to obtain. Paper water is the gap between what the city anticipated it would need for it future growth versus the amount of water it actually received. 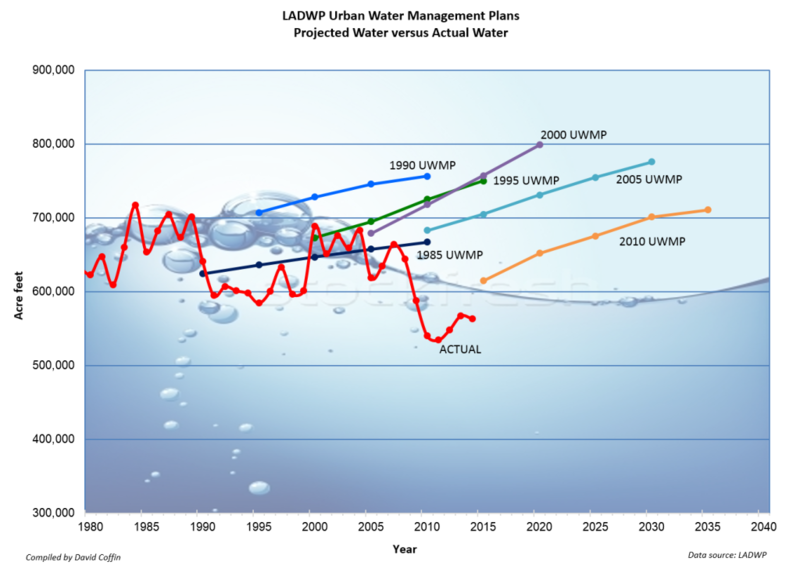 The projections appear in the city's Urban Water Management Plan (UWMP) which is published and approved by the city council every five years. The city uses paper water along with real water to demonstrate that it has sufficient water supplies for the thousands of medium and high density projects going through the planning process. As time goes by however the city has not been able to access that water which has created a severe deficit resulting in a drought. Despite not having access to this water, each new water plan continues to anticipate levels of water supplies that it clearly has no access to. Residents caught in the middle of this vicious drought/growth cycle and have been forced pay for this policy with higher utility prices, enforcement actions, and lower property values. Chart showing the gap between actual supply the city receives and anticipated supply projected in each UWMP.